Aging is a part of life. From the moment we are born, at the first cry, aging begins. In early life, aging is your friend. During youth, it was a joy to age. We looked forward to it. Every youthful birthday was attaining the brass ring. In the formation years, our birthdays were celebrations. Through the eyes of the innocent, blowing out the candle was full of hope – for wishes and dreams. And the energy? Why walk when you can run? Why speak, when you can shout? Why wait with patience, when you can hop up and down, as mommy and daddy decided? Then life entered the roaring 20’s. How majestic they were. Oh the days when invincibility was the norm. My back felt great. I believed that I could lift anything and everything. During Bible College, I worked in a warehouse, I was always being reminded by some old geezer that I needed to lift with my legs. So I did, I would use my legs…. ahem, while they were watching. But in my head, as a twenty-something idiot, I remember thinking, why do old people always say that? Why do they feel the need to boss me around? Besides, I don’t need to lift with my legs… Don’t they know how strong I am? Then the 30’s came. I remember it vividly. On the day I turned thirty, for the first time in my life, the confidence I had in my 20’s had suddenly diminished. I didn’t feel the same. Thoughts rushed over me. Can I do this? Be a man? I also noticed something else, my intellectual confidence was weaker. It was weird. It was like I had lost something. …I did not know anything! Then something else happened, two years later, Donna and I met a local married couple. They were moving to a town thirty miles away. We had only known them for a few days, but I decided to help them move. One of the reasons was Christian duty, but the other one was selfish. … So that I could lose weight. Yep, during my 20’s, I could work hard for a weekend by helping someone move their furniture, and I would end up losing 5 to 10 pounds. This couple needed help. I needed to lose a few pounds, so I figured this would be a win-win opportunity. However… It didn’t work. The extra weight didn’t go away…HUH? It always did in the past. What was going on?I told Donna about it. “Maybe you need to jog.” She said. So I did. Sneakers and all. But the weight didn’t fall off. Again I asked, What’s going on? It was like a switch had been flipped inside of me that told my metabolism to slow down. I didn’t sign up for this, I complained to Donna. Then the other changes arrived. A few aches here and there. “Well lay down on the carpet and I’ll rub it.” She said. I slowly got on the ground. But then, I got stuck. I couldn’t get back up. I was stuck in the ground for hours. Donna thought it was funny. “You’re making fun of me. You don’t love me,” I whined. I shut up. I recovered in three days. Donna had to help me. She didn’t laugh out loud, but told me later she was laughing at me behind my back. New ailments started showing up – joint pain. It wasn’t too bad at first. But for the most part, I still felt strong. And competitive. The 40’s showed up and a new drifter showed up – ailments. One day, I noticed something wasn’t right. I was weaker than I used to be. For the first time in my life, my youthful zest was noticeably gone. I decided to go to the doctor. She told me, “you have lupus.” That was 2003. I was 42 years old. I share this to be transparent and also, because many others also begin finding irregularities in their bodies as they hit middle-age. How many of you have also gone through a familiar journey? You were young and strong, but then one day everything changed. You noticed an abnormality, or a pain that had not been there before. Perhaps it was a growth, or something that was inconsistent with the strong body that you had up until that point. Many women begin dealing with hormonal changes in their 40s. It can be very difficult. Menopause can begin in the 50s, but peri-menopause can begin in the 40’s. And it can also be very difficult. The hormonal changes can wreak havoc with the females sense of sanity. And leave them wondering, “what’s wrong with me?” Some of you ladies out there know what I’m talking about. And if you may be going through this, I feel for you. Because Donna, has started experiencing it lately. I know it’s not easy. This week, I turned 54. The previous ailments that arrived with a whisper have become noticeable and frequent. My thought process has changed. I have dealt with lupus now for 13 years. Additionally, several other ailments have come and gone. My youthful confidence has turned into cautious optimism. When my older boys lift boxes for me, I often remind them to lift with their legs. The longer we live. We see that ailments never quit trying to show up. – Some of them come and go. – Some of them can be prayed away. – Some of them can be fought against … for a season. – Some can be prevented with the right measures. Other times, they just show up. Unexpectedly. Even to the strongest, healthiest person. And get this folks, ailments will even show up upon the most righteous prayer warrior. Why? I don’t know. We can speculate. Contemplate. Assume. But it happens. One of the most anointed men in the Old Testament was Elisha. In his later years, he succumbed to an ailment, and died. How could such an anointed man die of a sickness? Answer: Because eventually everybody dies of something. Some could attempt to throw a blanket assumption that applied to all. But that is all it would be. Because nobody knows everything. I say this, because I know that there are some that would try to offer the one-size-fits-all spiritual answer, but in my 35 years as a Pentecostal, Holy Ghost, miracle believing follower of Jesus, I have never seen the one-size-fits-all answer be 100% applicable. What does this mean? It means that at some point many people will hear the announcement… It is your turn! Brethren, aging causes ailments. And many have found that this is their cross to bear. …Even when they do not want it! But it happens. If you have been blessed and never had an ailment. Then thank the Lord for his mercy. … Wondering about the severity. … Wrestling with the terms. … Wondering what to do? Do night prayers rise from the your pillow that plead with God? 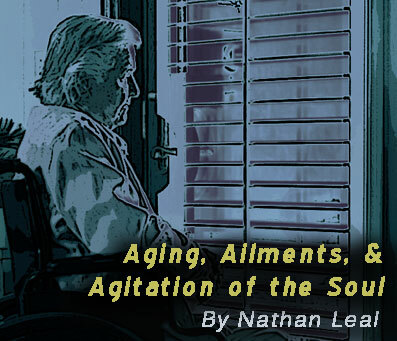 For people dealing with the ailments of aging, agitation is the weather of the soul. Most healthy people have no clue how difficult it can be. Including family members. And fellow Christians. A family could be sitting around the living room. All ages. The kids. The parents. And grandma or grandpa. They could be watching a movie. Laughing. And not realize that a hurricane is pounding the soul of grandma as she sits in her chair quietly, while they laugh. Why? She is dealing with frenzied thoughts because of her ailment. She exhibits calm, but inwardly, the turbulence and the tempest is howling. She may be battling fear. Frustration. The unknown. The details. The diagnosis. The therapy. The expense. The medical bills. If the ailment is potentially life-threatening, she may be concerned over their grief when she departs. She may be sitting there quietly whispering prayers for her loved ones. Asking for God’s protection for them. Asking God to save them. Asking God to keep them safe if the ailment takes her home. No one around her has a clue that it is going on. They just figure she is groggy old grandma with not much to say. Sound familiar? Have you been there? Are you there right now? Is there a storm taking place within you, because of an ailment? Are you trying to hold it together within? And just keep these things between you and God? Trying not to complain? Ailments and agitation will mess with the strongest soul. It doesn’t matter who they are. Especially if the ailment is bad enough or life-changing. And if you are waiting for an exam to pinpoint the details, the enemy will try to fill your mind with fear and doubt to make you believe that the report will be worse. But by faith, you must stand. My friend. For the sake of your family. Your loved ones. And your victory. You have to my friend. Even when it’s scary. Because that’s all we have. Our faith. When a loved one is suffering from an ailment, the family can also suffer. Depending on the severity, ailments require caregivers. This usually falls on the shoulders of a spouse or family member. The task can be emotionally draining. Why? A lot of reasons. They range from requirements that can be physically exhausting. 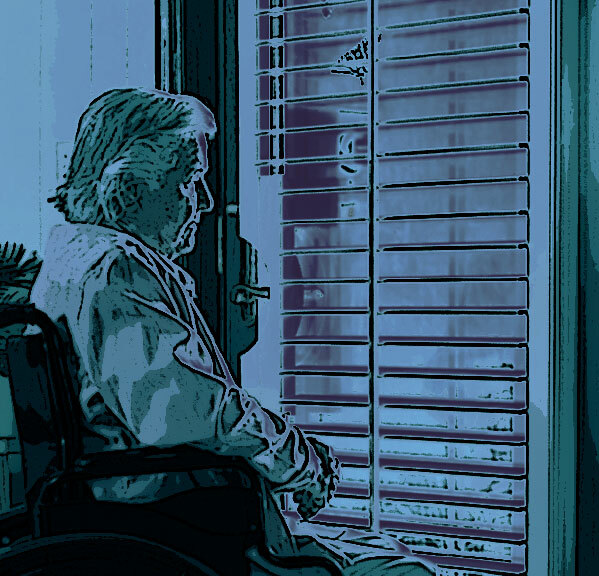 All the way to the mental toll that is suffered by loving family member who has to watch their loved one who was once strong and spry, become weak and deteriorate. And deal with personality changes. They have to be the strong one, but in private, there’s a lot of weeping. … How are we to survive the financial toll? … How are we going to afford this? … What if they don’t recover? … How will I deal with it? … How will I move on? The anguish can be terrible. If this is you my friend, please know that you are not alone. And it is by faith that you must navigate through the ailment. …In other words, false voices will prophesy, The Lord has said this is going to come to pass, But God NEVER said it. This is a dangerous practice. 3. Of not having enough faith. 5. Of been punished…. Etc. …It is called getting old. And it is going to happen to everybody. Brethren of the faith, until Jesus returns, all of us will get hold. And aging causes ailments. Is there anyway to prevent them, or reduce them? Possibly. Because some ailments are the result of the neglect and abuse that happened during our younger years. Some ailments could be improved or offset with better food and nutrition choices. Watching over and caring for our bodies as we get older must become a discipline. Monitoring nutrition and eating healthy is a good practice. Also educating ourselves about natural remedies and better food choices is a good discipline. This is the Word of God. Threescore and ten totals 70 years. Fourscore is 80 years. This means that God has programmed the human body with an expiration date of between 70 and 80 years of life. Yes, it’s true a few people go further, but it’s not much. God is our Creator. He programmed our DNA to eventually expire. As our expiration date approaches, our bodies age. The cells change. Our body chemistry changes. Deterioration begins. It’s the aging process folks. It cannot be stopped. Yes, perhaps some nutrition can slow it down a little. But aging will occur to all of us. And while the body grows older, ailments will accompany the aging process. My friends, God has determined that this is how it will be. Do you have an ailment? Do you wonder, “what will become of you?” If so, God wants you to discover His grace during the ailment years. God’s grace is always something to be desired. Because with His grace, we will be able to possess our faith and stay positive about our dilemma. We will also possess His peace which helps us to overcome fear and negative thoughts. His grace helps us to battle the inner agitation that tries to cause doubt and more stress. And my friend, the last thing that you need to be holding onto is stress. Often times, stress will make the ailment worse, because it can cause inflammation, which leads to pain, discomfort, and other difficulties. Stress also slows down healing. It’s simple. By prayers and supplication. Replace worrying thoughts with prayers. While you are sitting and resting, pray. When you lay your head on your pillow, pray. When you wake up, pray. And when you need to… do a lot of crying. Jesus comforts the weak and brokenhearted. Earlier, we were talking about some of the spiritual causes of ailments. I would like to mention one possibility. Confessing faults to one another is very powerful. Because it shines the light into areas that do not want to be exposed. Sin hates to be exposed. But when the light of God is placed on it, it can no longer hide and is banished. For those who live alone, the same process can occur in the prayer closet. Alone. Just you and God. Whatever your situation is. Repentance never fails. And should be a regular practice for spiritual health. Confessing our sins to God and becoming cleansed is a heart of repentance. According to the verse above, healing can take place by confessing sin. Does it happen every-time? No, But healing would probably happen more often if people did it. Give it a try folks. If some of you are struggling with an ailment, and you are spiritually dry. Take some time alone with God. Ask them to cleanse every part of your soul. Ask Him to show you any area of your life that needs to be cleansed. What if the healing does not come? Then try your best to make the best of it. Ask God for the strength to endure it. Ask Him to give you wisdom out of the experience. Ask Him to use it for His glory. Can your familiarity with the ailment help others with the same situation? …All things work together for good. Allow the ailment to turn you into a vessel of honor. Purified. Made white. Holy. Acceptable. Doing the Father’s business. …Even when it hurts. He wants to be with you as you walk your road. May you be blessed and encouraged.